Evangelical Textual Criticism: The Source of Scott Carroll’s Mummy Masks? 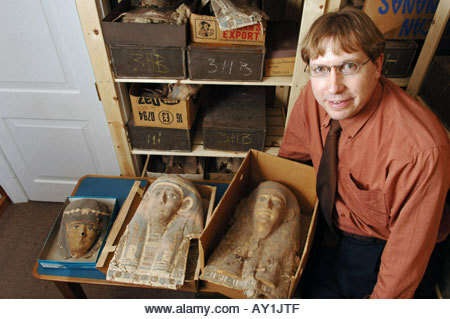 The Source of Scott Carroll’s Mummy Masks? Brent Nongbri has been writing some very good posts lately on his blog about Scott Carroll and the papyri he has been showing at various events. But today, Brent has followed that with an even more startling post exploring where Scott Carroll got all those infamous mummy masks from. In any event, the close association between Pattengale, Carroll, and Professor Obbink (as well as the Green Collection and Oxford) has long been known, and Professor Obbink appears to still be on the Museum of the Bible payroll. What was news to me was Carroll’s suggestion that Oxford was a source of the mummy masks that he was purchasing (his usual practice in describing provenance in these more recent videos is to say the material comes from “families” looking to sell things). Scott Carroll has also suggested that Professor Obbink offered at least one artifact from the Egypt Exploration Society’s collection for sale (the Oxyrhynchus papyrus P.Oxy 83.5345, a fragment of the Gospel According to Mark). Professor Obbink and the Egypt Exploration Society have both denied Carroll’s claims in regard to that papyrus. Now we would seem to be in a similar situation with regard to the Green Collection mummy masks, in that all we really have connecting the Green Collection masks to Oxford is the word of Scott Carroll. And once again, it is the Green Collection and the Museum of the Bible that could shed light on these questions by offering some transparency in their acquisition records for these artifacts. You can read the full post with what Brent has been able to piece together from videos and online matter. Re the current relationship between MOTB and Prof. Obbink: In November 2017, the Museum took steps to bring its relationship with Prof. Obbink to a close. The Museum and the professor have gone their separate ways since very early in 2018. Not to suggest that Dr. Holmes has to address anything beyond what he said here. But this comment seems to me to lend some weight to Scott Carroll's account of Obbink's attempt to sell them P.Oxy 83.5345. Does anyone know the circumstances in which Scott and the MOTB parted ways? If not, perhaps a little more transparency is needed here.